3/20 (4:15pm): Rain water results show trace levels of radioactive iodine (I131,I132), cesium (Cs134, Cs137), and tellurium (Te132). The amounts show that the activity we are observing originated from any of the three operating reactors that was shut down since I-131 and Te132 half-lives are less than 10 days and the spent fuel from unit 4 had not operated for > 130 days.The calculated exposure to the public is so low that the consuming of ~500 liters of this water would only increase dose by the same amount received by taking a cross-country airplane flight. Somehow, I don’t take comfort in the analysis to a plane flight. Geez, what a toxic world we live in! Yesterday, I did gain some comfort when writing a review on a new children’s multivitamin, which contained potassium iodide. It gave me some relief, considering the shortages in this country, that we had some in our home. I was even more pleased when I looked at the current multivitamins we have to see if they had any iodine. I was happy to see they do, and even better, it is sourced from kelp! Typically, my children take [amazon_link id=”B00024D3AS” target=”_blank” container=”” container_class=”” ]Rainbow Light’s NutriStars[/amazon_link], but the health food store I shopped at last did not have them. NutriStars also contains potassium iodide (35 mcg per tablet). Two tablets equates to 47% daily value (DV) for a child over three-years-old. 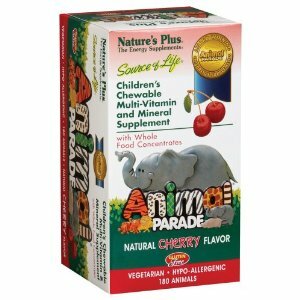 The multi-vitamin I recently bought is [amazon_link id=”B00012NGZI” target=”_blank” container=”” container_class=”” ]Nature’s Plus Animal Parade[/amazon_link]. The iodine in these chewables is from kelp! Each tablet contains 50 mcg, and two tablets represents 67% DV for children over four-years-old. I take comfort in the kelp-sourced iodine in my children’s current multi-vitamins, and I take comfort that their bodies may not be as deficient as I originally feared. With the addition of extra seaweed in our diets, I think my children are relatively protected, at least more so if they weren’t talking their vitamins. After reading this I immediately grabbed our children’s multi-vitamin (yes, we give them the old traditional Flintstones Complete) to see what it contains and yes it does contain iodine as well (150 mcg.) I’m not sure where it originates from or whether it is seaweed sourced like the Nature’s Plus product but I guess it’s nice to have it in there. Scary times in Japan and around the world and giving kids a multi-vitamin gives you just a little bit more piece of mind that you’re doing the right thing for them in a crazy environment. Mean Joe Green Cartoon: Get Those Kids Outside! Is juice bad for kids?